Anadir Cabin is a small shack at Esplanade in Kolkata with a very humble setup famous for its Mughlai Parathas. My Esplanade visit on any errand would always end up eating at Anadi's. 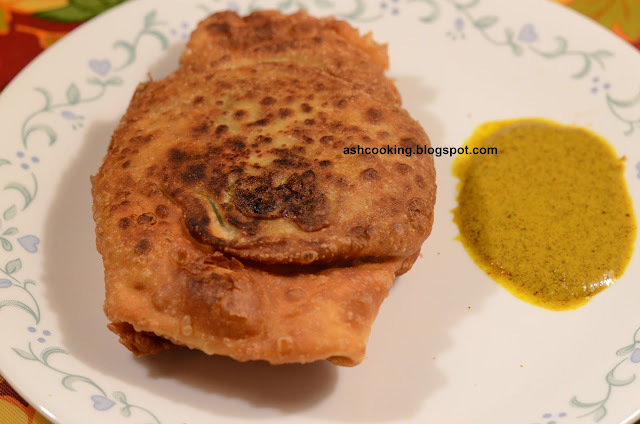 Its soft yet crunchy exterior with mushy stuffing inside melts in your mouth. The following recipe is of a Mughlai paratha I have concocted out of my own perception with the ingredients I felt are used in Anadi's Mughlai. It turned out really lip-smacking and my husband was full of praises. 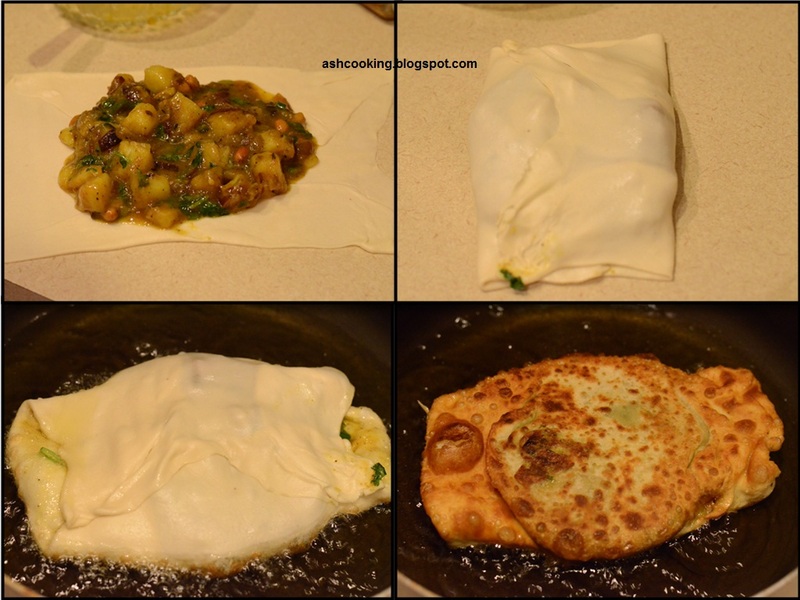 If you have tried out EggChicken Mughlai Paratha at home, then Egg Potato Mughlai Paratha is another version sure to win your heart. 1) Boil the potatoes in microwave for 9 minutes. Then chop into small cubes. 2) Heat oil in a wok and add cumin seeds. Allow it to crackle. Add peanuts and shallow fry. When peanuts begin to turn brown, add onion and fry till it changes color to golden brown. 3) Add green chillies, turmeric powder, garam masala powder, cumin powder, black pepper and salt. Add 2 tbsp of water. Cook for 1 minute. Toss the potatoes in and mix. Turn off the heat. Divide the stuffing into two equal portions. Break eggs into them apiece. Stir in. 4) Mix in all-purpose flour, salt, sugar and baking soda. Add 1 tbsp oil. 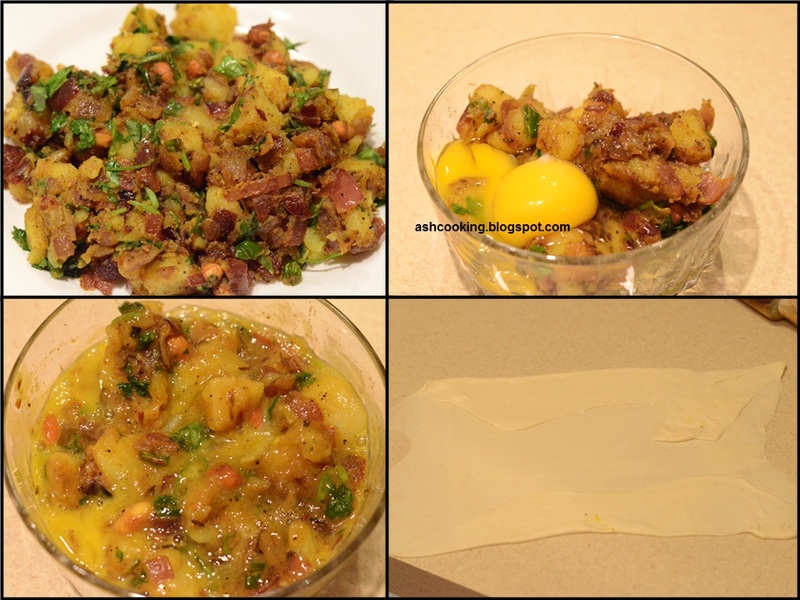 Rub the mixture in with your finger; it will help the parathas become crispy. Add water to knead dough. 5) When a soft supple dough forms, drizzle the remaining tablespoon of oil onto the dough and knead again for 2 minutes. Now divide the dough into 2 balls. 6) Grease the work surface with oil. Roll the balls out into 10 inches long rectangle. Fold two sides as shown in the pic. Spoon the stuffing across the middle and fold the top and bottom sides. 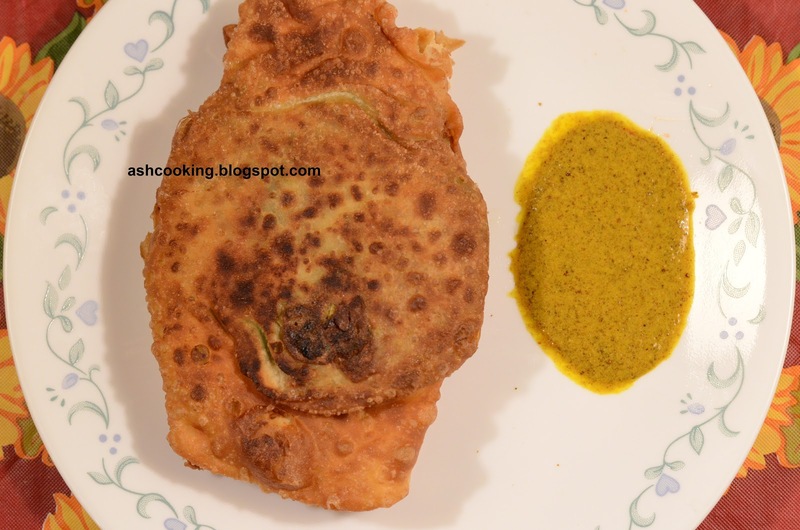 7) Heat oil in a wok and deep fry the mughlai parathas. 8) Serve hot with kasundi or mustard sauce.